Andrew Carnegie was a businessman and philanthropist. Many libraries were built across the USA under grants offered by Carnegie. A total of 2,509 Carnegie libraries were built worldwide between 1883 and 1929. In the USA, a total of 1,689 were built under grants that required agreement to terms set by Mr. Carnegie. Many of the libraries were unique, the library in Stillwater being no exception. The community was responsible for choosing the style, in this case, Beaux-Arts for the Stillwater library. The grant from the Carnegie Foundation were large. In Stillwater, Carnegie contributed $27,500. 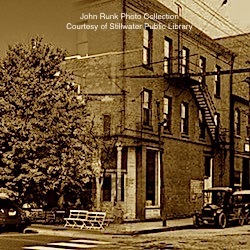 The grant for the Stillwater library was more than twice the amount of a typical Carnegie grant for this time period. Carnegie required the elected officials to demonstrate the need for a public library; provide the building site; pay to staff and maintain the library; draw from public funds to run the library, not use only private donations; annually provide ten percent of the cost of the library’s construction to support its operation; and provide free service to all. The library was built on the north Fourth Street address (Address changed to the north Third Street location in 2006). The original building was built in 1902. Other additions to the library were made in 1973 and 2006. Carnegie’s grants also stipulated plans for future expansion and the Stillwater community has kept the spirit of his contribution alive. The architect was Patton and Miller of Chicago, Illinois. The builder was O.H. Olsen. List of Carnegie Libraries in Minnesota, This includes photos and grant totals.